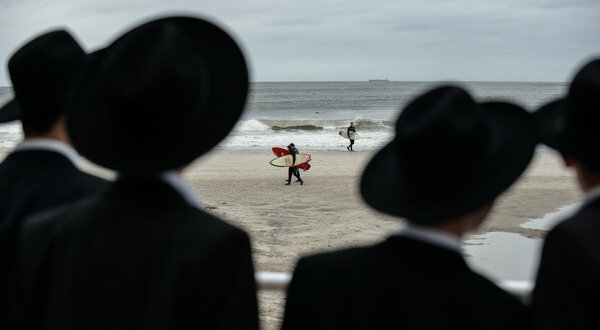 We like this pre-storm photo from the Times (Shallow Waters and Unusual Path May Worsen the Surge) of endless young daveners watching endless summer surfers in Long Beach, NY. 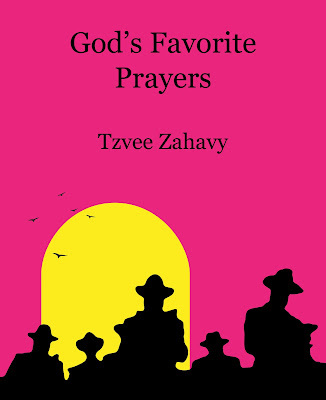 This reminds us of the book cover that we designed for our book about our search for the perfect prayer, God's Favorite Prayers. We are fond of pointing out that we had this poster in mind when we designed that cover. The billionaire pledge seeks commitments from the wealthy to give generously to philanthropies. One billionaire quoted in the article cites the Talmud. Somehow the writer found a cloud to put inside this silver lining. Read: The Billionaire Pledge: Is There a Downside to Giving Away Billions? The AP reported, "Comic actor shows dramatic chops in 'Disgraced'"
It’s an oft-used device in theater: The doomed dinner party, a gathering that starts out politely, with house gifts of wine or pastries and glasses clinking over civilized chatter, and ends up in horrific, angry chaos. But when that party chatter touches on Islamic and Judaic tradition, the Quran and the Talmud, racial profiling and Sept. 11 and the Taliban and Mahmoud Ahmadinejad and Benjamin Netanyahu — along with the requisite alcohol intake — well, that’s a whole other level of chaos. And it all unfolds with speed, energy and crackling wit in ‘‘Disgraced,’’ a terrific new play by the actor, novelist and playwright Ayad Akhtar. We like the analytic mode of discourse. It is more Talmudic. So a while back we noted the use of the concept "illusion of competence" that someone employed to describe what happens when you practice at a golf driving range. When you later go out an play you find that how you do in practice has weak correlation to performance on the course. In today's Times two academics published an op-ed that used the notion “illusion of explanatory depth,” calling it "an idea developed by the Yale psychologist Frank Keil and his students." This essay describes research that separates real explanation and understanding from what we used to call "double talk", i.e., when someone explained the incomprehensible with additional incomprehensible or non-related ideas. There is so much of that going around in this political season, more than we can ever recall. We resigned from political conversation of any kind this year because of that and because of one other concern, namely the utter rudeness and obnoxiousness of the discourse of this campaign. We said to a right wing friend yesterday at a wonderful Shabbat Tea social event, that we would not engage with her in political discussion this time around because of the rude and obnoxious talk coming from both side of the aisle. Apparently, that balanced criticism was not sufficiently clear or acceptable to her. She immediately responded by attacking me with her certainty that Obama supporters started the rudeness, hence she had every right to keep it going. The Times essay is a brilliant restatement in social scientific terms of what we know from common sense. Thoughtful discussion on issues often brings people together. Harangues laden with double talk mostly keep people apart. Read the essay by Steven Sloman, professor of cognitive, linguistic and psychological sciences at Brown University and Philip M. Fernbach, assistant professor of marketing at the University of Colorado’s Leeds School of Business. 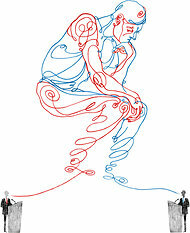 It purports to reveal, "why partisans can't explain their views." And just walk away from those who want to harangue you. There is no point in staying to try to talk. Wow, Billy Graham stopped calling Mormonism a 'cult' on his website. The citizen-times.com site reported, Article calling Mormonism 'cult' disappears from Graham website - Change on Graham page comes after Romney meeting. Romney is still not a Christian - but at least he can sigh in relief that according to Billy he is not a member of a cult. The Jewish Voice (a mysterious publication) reports,"At Age 84, Elie Wiesel Transcends Major Heart Surgery to Write Book on Near-Death Experience"
He has achieved legendary status around the world as a Jewish Holocaust survivor who was able to emerge from the darkest horrors and turn his life into a beacon of meaningful activity as a human rights advocate. Yet at age 84, Elie Wiesel still has personal and professional mountains to climb – he recently underwent quintuple heart bypass surgery, and while still in the beginning stage of recuperation, he began writing a new book about his latest harrowing experience. We respect and admire EW. He embodies the best of a person's ability to bounce back from suffering, and continues to prove that even now as he recovers from financial and medical setbacks. One Term More - With Subtitles from One Term More on Vimeo. We can't recall a more spirited political musical adaptation. And it covers all the main points of why you want to vote for Barack Obama and not for Mitt Romney. Delightful. Hat tip to a very good friend (who loves Broadway show tunes). Business Standard reports, "Indian woman fights against powerful Jewish religious body." 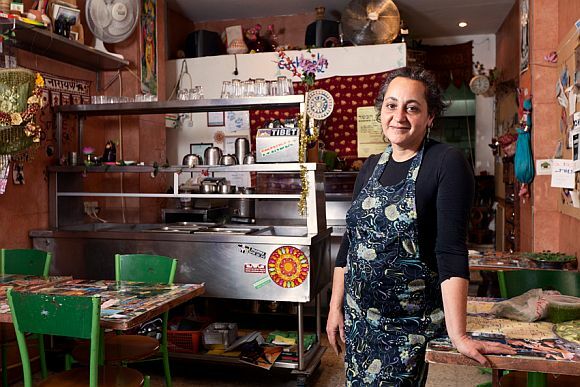 An Indian woman, owner of the a restaurant here, has stood up against the dictates of the powerful Jewish rabbinate and decided to give up the kashrut certification for her restaurant after she was forced to buy vegetables in specific stores. Lehava Silman Herman, 50, who runs Ichak Dana Indian restaurant in Jerusalem's Mahane Yehuda market gave up kashrut certification for her restaurant following "impossible demands" made by the Rabbinate. Mahane Yehuda has an overwhelming religious Jewish population which only dines out at Kosher restaurants. Lehava, who immigrated from Kolkata in 1981 and still holds an Indian passport, told PTI that she is not going to succumb to the pressures of "impossible demands" being made by the Kashrut supervisor that is "acting like a mafia leading to corrupt practices". "On November 8 renowned singer-songwriter, composer, musician and poet Alicia Jo Rabins will debut her brand new, full-length performative song cycle A Kaddish for Bernie Madoff at Joe’s Pub in New York City. The controversial piece explores the spiritual implications of the financial collapse through the story of Ponzi schemer Bernie Madoff, attempting to uncover hidden meanings in this contemporary tragedy. A second performance follows on November 15." The article cites the Talmud siyyum as proof of traffic congestion, but that makes little sense to us. "Having the American Dream mall open on stadium event days will cause gridlock of proportions we have never experienced,” Jets and Giants spokeswoman Karen Kessler told WCBS 880′s Levon Putney. The New York Jets and Giants have both sued the developer, Triple Five, saying the current project vastly differs from the original plan that was agreed to in 2006. Traffic experts hired by the teams said the mega-mall would add 7,700 cars to the already-congested roadways on game days, Kessler said. “We presented over 700 pages of detailed analysis, charts and traffic models,” Kessler said. The teams, in addition to some local leaders, have opposed the development of the mega-mall citing traffic concerns around the Meadowlands. A judge dismissed part of the teams’ lawsuit in June but said they can refile. We haven't seen the show. But based on one review we conclude that British TV has a show that mocks Jewish mothers with, "Extreme examples of every Jewish stereotype … the eight mums of Jewish Mum of the Year." It was also never entirely clear how the programme had picked its eight contestants, though it looked very much as if the producers had gone out of their way to find extreme examples of every Jewish stereotype: the bling princess, the control freak, the ultra orthodox, the smotherer, the delusional, the neurotic. As an advert for most people's idea of a mother from hell it couldn't have been bettered and was undeniably good fun to watch – so long as you weren't one of the eight women, who gave every impression of believing they had entered a serious competition. Do we hear protests? Anyone? Here is the official TV show web site. No, football in Texas is not Jewish. It is Chritian. 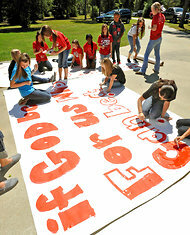 According to the Times, "In Texas, Cheerleaders’ Signs of Faith at Issue" - Christian professions of faith are exhibited at High School football games. Yes, as we see it, this makes the enterprise a Christian sport. Is that what we want in America? To reduce religion to a high school sport? Is that what we want in America? To exclude all but the most fundamentalist Protestants from rooting with the cheerleaders for the local teams? Apparently some people think that is what we want in America. We disagree. Sadly, this matter is being litigated in court. For our Teaneck Orthodox neighbors Shul membership has its rewards. Paid up members get priority and perks in aliyot to the Torah and chances to lead services. In Germany according to the AP the church makes it clear. If you want the religious services of the church, you need to pay up. We cringe at this business bluntness. Once you start acting like a profit making enterprise, you simply lose all access to your soul. 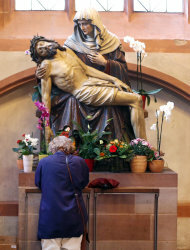 BERLIN (AP) — The road to heaven is paved with more than good intentions for Germany's 24 million Catholics. If they don't pay their religious taxes, they will be denied sacraments, including weddings, baptisms and funerals. A decree issued last week by the country's bishops cast a spotlight on the longstanding practice in Germany and a handful of other European countries in which governments tax registered believers and then hand over the money to the religious institutions. In Germany, Catholics, Protestants and Jews pay a surcharge of up to nine percent on their income tax bills — or about €56 ($72) a month for a single person earning a pre-tax monthly salary of about €3,500 ($4,500). The Catholic Church in Germany receives about €5 billion ($6.5 billion) annually from the surcharge. For Protestants, the total is just above €4 billion ($5.2 billion). Donations, in turn, represent a far smaller share of the churches' income than in the United States.